Dogs, just like their owners, need a change of scenery and a little socializing every once in awhile. Sometimes the usual backyard jaunt isn't enough. If your pooch is dying to stretch his or her legs and meet some new friends, we've got everything you need. 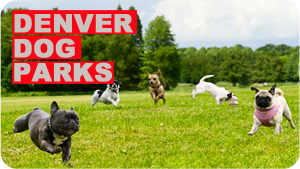 Here's our list of the top dog parks in Denver. There are several brand-new options for canine lovers looking for off-leash parks, but the classic Greenway Park is still arguably the best. This location earns rave reviews for cleanliness, security, and friendly visitors (both canine and human). The park’s amenities include copious plastic bags, hydrants, and shaded benches. At the Stapleton Dog Park, your little friend can dig in the sand, roll around in the mud, and run wild through large grassy areas. It’s a huge park with a convenient location for many residents of Denver’s east side. No pitbulls and children under 12 years old are not permitted to enter. The dog park at Berkeley Lake Park on Denver’s west side, isn’t the biggest patch of canine-friendly land in the metro area, but it’s still one of the best. It’s nestled in one of Denver most historic and beautiful neighborhoods, and it offers gorgeous lake views (although no lake access). It’s a fun spot to unleash your furry friend and let them roam free in the dirt and grass. Pitbull ban enforced.